CBD products have really come to the fore over recent years as more people are becoming convinced of the benefits that CBD could potentially provide. As a result, more companies than ever before have sprung up to sell CBD products, but how do you know which ones are reliable and which ones offer poor-quality products? One company which recently came to my attention is Reef CBD, a California-based company which specializes in supplying high-quality and all-natural CBD products derived from organic hemp. 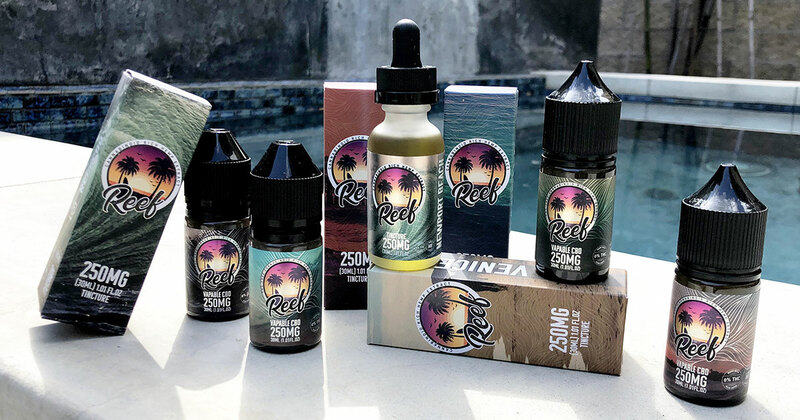 Reef CBD’s branding perfectly reflects the Southern California lifestyle and being born and raised in SoCal myself, I found myself really drawn to it! I have also seen them being sold in smoke shops so I decided to try them out for myself to find out whether the brand’s hype lived up to expectations. One of the first things I’ve learned to look out for when it comes to choosing any new CBD product is whether or not the brand uses a third-party lab to rigorously test their products. I was pleased to find out that Reef CBD does indeed carry out comprehensive testing of its products to prove the level of CBD and to demonstrate that there are no unwanted contaminants, pesticides or THC contained in them. The information is all there to see on their website, which means that I could have complete peace of mind in trying out these products. If I’m shopping for CBD products, I like to have a comprehensive selection to choose from. Reef CBD specializes in offering CBD-infused gummies, CBD vape oils, and CBD tinctures to suit the needs of a wide range of people. Whichever method of delivery you prefer, there’s something to suit your tastes here. I decided to try out a few different products including a number of vape oils and some different tinctures, all of which came in a range of exciting flavors. One of the best things about vaping CBD is that it is speedily delivered into your body without having to pass through the digestive system. This means that the effects can be felt quite rapidly. I tried out four of the five Reef CBD Vape Oil flavors – Blue Raspberry Iced, Fuji Apple, Fruit Cereal, and Watermelon Iced. I was very excited about trying such a wide range of flavors, all of which come in a choice of three strengths – 250mg, 500mg and 1000mg – and which are suitable for use in all kinds of vaping device. All the e-juices I tried were in 250mg strength. The Mavericks Fuji Apple flavor is tart and sweet while the Pipeline Blue Raspberry Iced is rich in berry flavors with a hint of menthol on the exhale. The San Onofre Fruit Cereal vape juice took me back to my childhood with a fruity breakfast-time kick while The Wedge Watermelon Iced was just as flavorsome as I expected with just enough of a menthol hit to make me feel wonderfully refreshed. Some plain CBD tinctures can be pretty unpleasant to take with a very distinctive hemp flavor that is definitely an acquired taste. Reef CBD Tinctures have solved that problem by making wonderfully flavorsome tinctures that are just delicious. I tried four different flavors, all in 250mg strength and was impressed by them all. The Cardiff Blue Raspberry boasts a rich, ripe, berry flavor while the Cocoa Beach Peppermint is incredibly refreshing. The Newport Beach Orange Citrus has all the sharpness that you would expect while the Venice Lemon Citrus explodes on the tongue for a totally tropical experience. I had no issues alternating the last two citrus flavors in the morning – they help wake me up and put me in a good mood. For anyone who wants to avoid the psychoactive ingredients contained in some other cannabis extracts, Reef CBD is the ideal choice. All of its products are made from organic hemp and have no detectable THC content. They’re also hexane-free and solvent-free, so you can be confident that you won’t be harming your health by using any of these products. How Can Reef CBD Help? Many people these days are extolling the virtues of CBD products, believing that they can help to support mental health and well-being while also helping to support healthy joints. As a useful supplement, Reef CBD’s products helped to make me feel more focused and calm and also helped me to manage my everyday stresses and strains more effectively. Some users have reported that taking Reef CBD products helps to support their healthy sleep cycle and to help them to recover more quickly from exercise, all in one delicious-tasting package. Overall, I would definitely recommend Reef CBD products to anyone who wants to try the potential benefits of cannabidiol for themselves in a tasty and pleasant way. Here's a discount code for PGL readers that want to take the plunge with Reef CBD! Visit reefcbd.com for the latest deals and sales. Cant wait to try all the new tincture flavors. I saw they have sour gummies, too which is not regularly seen elsewhere! Great review and visuals. Great help!